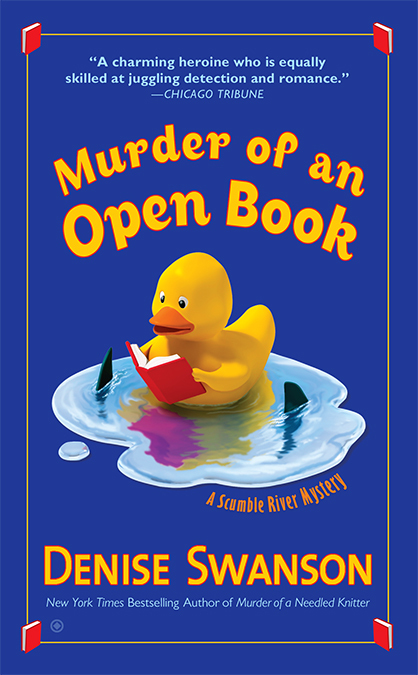 May Denison from Denise Swanson’s New York Times bestselling Scumble River mystery series. Hi! My name is May Denison. I live in Scumble River, a small town in Central Illinois and work four to midnight as a police dispatcher. Ninety-nine percent of the time nothing much happens during my shift. Maybe there’s a fight over at the Brown Bag bar or kids have a party that gets out of hand, but rarely any more serious crimes. Which means I have a lot of time on my hands and not much to do. I took up knitting, but my husband Jed says that if I make one more hat, scarf, or pair of mittens, he’s going to throw my needles in the burn barrel. I guess he has a point, there’s no more room in either of the kids’ bedroom closets. Speaking of kids, my son and daughter are finally both married. With Vince nearly forty and Skye thirty-six, I thought neither would ever make me a grandmother. Although, with my son’s success with the ladies, I was always a little afraid that I already had a grandbaby out there, but he just didn’t know about it. Vince’s wife Loretta just had the sweetest little bundle of joy. The baby shower is coming up soon and I’ve been combing the stores for the perfect decorations. Everything is going to match! Now, if only Skye would get with the program. She married the chief of police, and while I’ve come to see he’s a good husband, he’s forty-four so time is a wasting. Also, I’m a might worried that he might be…uh…you know, shooting blanks. He was married before and his wife left him because they weren’t able to make a baby. I’ve been keeping my opinions to myself since I surprised my daughter and Wally on their honeymoon cruise. Skye’s been a bit miffed at me since then. Hey, is it my fault the travel agent in town was offering a good deal on that particular trip because my knitting group had booked a block of rooms? Anyway, with all the time on my hands during my shift at the police station, I’ve been thinking about some of the things that I’ve recently observed. Skye gained some weight on the cruise and she isn’t dropping it. She’s not been feeling well any time I see her before ten a.m. And she was hiding something the last time I ran into her at the pharmacy. I think I might be a grandma for the second time real soon. But I’m not going to say a word until she tells me. I figure as long as no one gets murdered, I can wait. Just keep your fingers crossed for me that no bodies turn up. I don’t want my pregnant daughter investigating a murder. Murder of an Open Book sounds like a great read. Congrats on the book release!!! I really enjoyed the book and am looking forward to the next in this series. Cannot wait to see how May s predictions in the future turn out and how her family and friends deal with life and all of their own mysteries. Thanks, Caitytee! Glad you enjoyed the book!